The Treasury just announced that it will be auctioning a new 30-year Treasury Inflation-Protected Security on Feb. 19. This is CUSIP 912810RL4 and the coupon rate and yield to maturity will be determined by the auction. A 29-year TIPS currently trading on the secondary market today is yielding 0.73% (plus inflation), according to Bloomberg’s Current Yields. That same TIPS closed yesterday at with a yield to maturity of 0.723%, according to the Wall Street Journal’s Closing Prices. The US Treasury estimated yesterday that a full-term 30-year TIPS would yield 0.75%. TIPS 30-year yields have been rising a bit in last two weeks, up 23 basis points from the low of 0.52% on Jan. 30. Getting the yield above 0.750% is highly desirable for buyers, because it would lock in a 0.750% coupon rate. Anything slightly below 0.750% would push the coupon rate down to 0.625%. I generally advise buyers of very-long-term TIPS to hold them in a tax-deferred account, because it takes a coupon rate of about 0.50% to cover the yearly taxes resulting from 2% inflation, which is added to principal and taxed in the current year, but not paid out until maturity, or when the bond is sold. I also advise that a 30-year TIPS with a coupon rate of 0.75% can be a very dangerous investment if you can’t afford to hold it to maturity. If you are a TIPS buy-and-trader, you could be sitting on a time bomb. At least it will be very volatile on the secondary market. Traders might like that, but it’s a risk when the yield is this low. Only one 30-year TIPS in history has ever had a coupon rate below 0.75% – CUSIP 912810RA8 from February 2013, with a coupon of 0.625%. A breakeven rate of around 1.8% gives investors a ‘margin of safety’ because it means that 30-year TIPS yields could rise more slowly than the overall bond market. Say the breakeven rate gradually rises to 2.2%, a fairly common number. 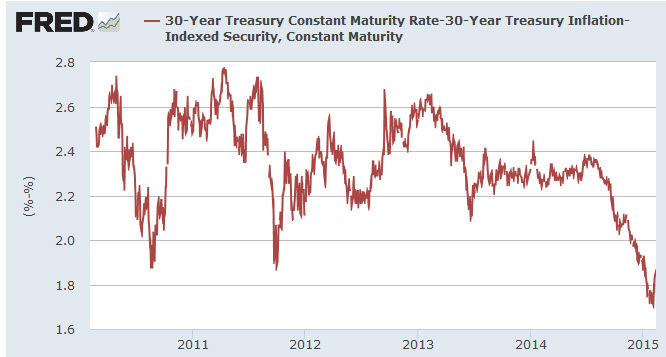 If a 30-year nominal Treasury rose 100 basis points to 3.57%, this TIPS would rise only 62 basis points, to 1.37%. But that would still be painful for buy-and-traders. I’ll be checking in on this auction next Thursday morning, and then again after it closes at 1 p.m. on Feb. 19. Since I’d be placing a non-comp bid anyway, it really doesn’t matter, but how the heck does anyone know what price to bid for a bond where the coupon is unknown? I mean, on re-openings, the coupon is fixed, eg, .625%, and the only issue is the price you are willing to pay for .625 plus CPI. I don’t get how this works on a new bond. It seems like you would have to guess on two things, both CPI and what the fixed coupon would be.I finding myself a bit scared!!! The big money people can probably get very close to estimating the likely yield by the time they make their competitive bids, which can be right up to 1 p.m. 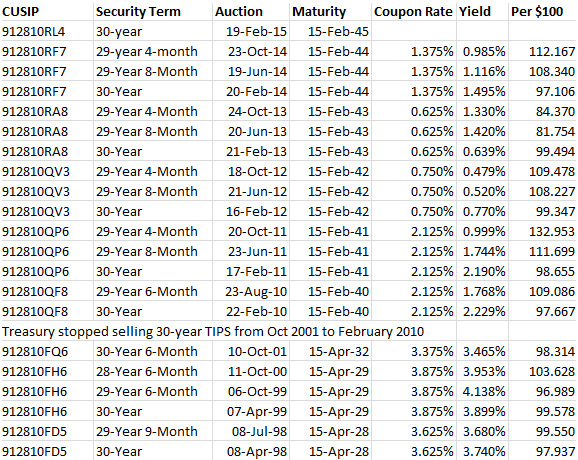 In every TIPS auction, the really important number is the yield to maturity, or ‘real yield’ (after inflation). In a new issue, the coupon rate is set to the nearest 1/8th percent below the yield to maturity. So new issues tend to go off right at par or at a slight discount. For reissues, the coupon rate is known but the yield to maturity still isn’t known, so the price the buyer pays can be much higher or lower than the par. The yield is the number to watch. I believe that competitive bidding is done by a yield number, not by a price number. All bids of the winning yield, or less, get the same price. Be sure you have enough money to pay the highest price that could result. Thanks for the replies, but at less than 1%, I’m not even thinking of buying. 30 years is a long time to settle for 1%.